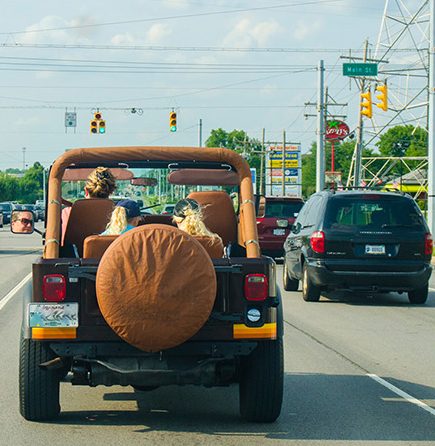 About 12 miles south of downtown Indianapolis, in Johnson County, Greenwood is officially a suburb or the Indy metropolitan area. It's a popular location for commuters to the city, but has plenty to offer in its own right. As the name suggests, it has an abundance of trees and other greenery, and its historic downtown along Main Street is a serene counterpart to the more energetic pace of city life. In Greenwood's many residential subdivisions, quiet tree lined streets wind around parks and ponds, and feature a combination of newer construction homes and houses built in the 60s and 70s. Commonly found architectural styles include contemporary modern (left), as well as rambling ranch houses and split-levels, with spacious driveways and garages. The average sale price of a home in Greenwood is approximately $225,000. However, of the 1737 listings which sold in Greenwood in the last year, 459 of them were between $120,000 and $170,000. 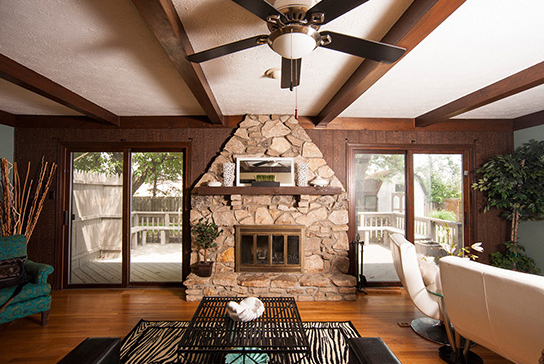 Charming decorative touches like stonework and ceiling beams (right) can often be seen in the mid-century modern houses of Greenwood. Lot sizes of a half acre or more are not uncommon. And man of the subdivisions in the area are built around waterways, with some homes featuring private docks (below). Greenwood is home to several dozen restaurants. Oaken Barrel Brewing Company and Revery serve New American cuisine, seasonal items, and craft beers. Vino Villa has small plates paired with wine and cheese; Lotus Garden and Puerto Vallarta offer Chinese and Mexican cuisine and two Indianapolis institutions, Yats and Jockamo Upper Crust Pizza, both have locations in Greenwood. 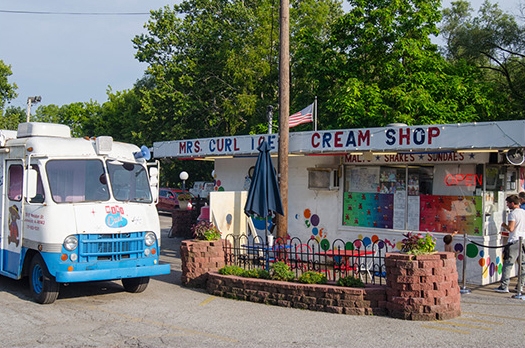 Mrs Curl Ice Cream Shop (left) near downtown Greenwood is a popular summer destination. Archer's Meats and Catering (below) sells locally raised meats and also processes wild game for hunters. With more than 150 stores, the Greenwood Park Shopping Mall is the fourth largest mall in Indiana. Below left, the Carhartt outlet shop; below right, live music is played at the mall's outdoor plaza. The Indy South Greenwood Airport, below, serves the general aviation community of Indiana with a 5,100 runway, two flight schools, maintenance facilities, refueling, and amenities for visiting pilots.